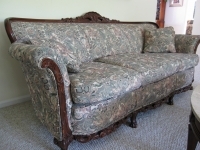 Mahogany Framed vintage couch and matching chair. Very functional, confortable, and fine condition. We love the set but do not have a good place for it in our new ROH home! 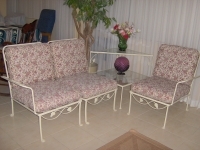 Was reupholstered just before we bought them 8 years ago. 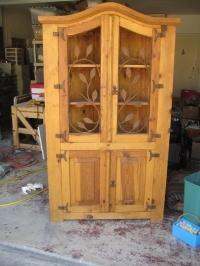 Solid wood corner hutch with rustic iron accents. 75" tall, 41.5" across front and 30" out from the corner (back sides). I bought it new in 1997. Excellent condition. Necky Kayak - Two Person Kayak and all gear, upgraded seats, quality oars available. Gucci Diaper Bag - Used. Please email for picture. Three 3 feet tall African Oil Palm Trees. These trees are relatively fast growing & can reach 50 feet tall. 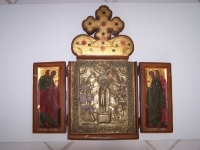 Religious Icon - purchased in Israel about twenty years ago. It is originally from Russia. Call Kathie Buddie on SW 4th street. Moses Basket for Infant. Matching Crib and Cradle bedding also available. Photo available to email, just not in the format required by the Swap Shop. Old World Cradle by Green Frog Art. 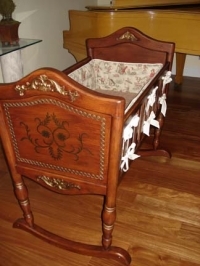 We barely used this cradle for our little one. Bedding available as well. 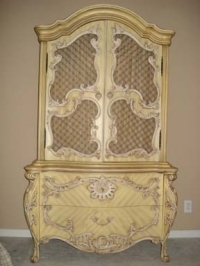 Beautiful Armoir with lots of storage! Email for additional photos!